On the 27th Sunday of Ordinary Time, the Revised Common Lectionary gives us another chunk of Mark with two very different stories. The temptation in Mark 10:2-16 is to let one story swamp the other. For the preacher it probably makes sense to choose just one. That’s probably the way to a coherent sermon. 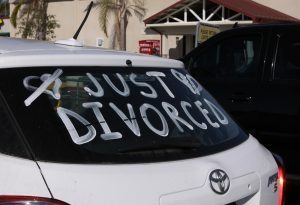 Some will focus on the discussion of divorce (Mark 10:2-12). Others will focus instead on Jesus blessing the children (Mark 10:13-16). It is sorely tempting to make the choice out dodgy motives: Either from a desire to take a hard line of divorce or to avoid such a dicey topic. Still others will assume some kind of divine inspiration on the part of the lectionary committee, and insist the two must be examined together. Personally, I think it takes some stretching to read a text like this as one coherent passage. But they are both there in the Gospel. Even if we aren’t prepping a sermon, we Christians need to deal with both stories. Jesus is being tested. Those pesky Pharisees are after him again, poking, poking, poking with their questions. The Gospels portray the Pharisees, remember, as the people who see righteousness in the perfect obedience to the law. Lest we misinterpret the interaction, the New Testament generally disapproves of defining righteousness as perfect obedience. In the #MeToo era, I do wish Jesus had pointed out the one-sided quality of the inquiry. It comes across as a question about men and their power over women. But Jesus doesn’t go there. The question is about the law, so Jesus has them look to the law for the answer. Yes, they find, the law allows divorce. Jesus sighed audibly, I’m sure, even if Mark didn’t record the fact. Yes, the law allows it, Jesus notes, but the law is often about dealing with the consequences of deep ongoing problems. Ah yes. As always, Jesus turns the tables. But before you think he just toughened up the standard by negating the law’s permission of divorce, look again. They came with an issue of legal permission — a law that solves a human problem. Jesus emphasized instead the ideal state — the created state, before sin ruined everything. Originally divorce was not to be needed. The promises made were intended to be permanent. Jesus pointed out the fallen state — “hardness of heart” he calls it, our condition after sin ruined everything. We think that sin ruined our relationships — making divorce necessary. Jesus points out that sin ruined our inner selves — leading to the actions we took, the attitudes we copped, that ruined our relationships. The thing is, Jesus didn’t redeem us to make us better Pharisees. And Jesus didn’t transport us back to the Garden of Eden, a pre-Fall state of pure and supple hearts. No: We are still post-Fall, broken inside, destructive outside. We still have hard hearts. Jesus isn’t toughening up the standard. He’s telling us how the system was set up from the beginning. He’s telling us how deep the problem is. And he’s telling us that even with what we think is a solution, the damage keeps rolling out. But you know — when it comes to the whole picture of life with Jesus, there is grace straight through it. When God set it up we were intended to be capable of lifelong fruitful, joyful partnership. When we messed it up, God allowed a stop-gap of divorce to keep the damage in check. And the whole enterprise of salvation is always about God’s forgiveness of the damage we’ve caused, and new life growing in the wreckage. In my first home I had great dreams of organic gardening. I started by making compost. All my kitchen waste went into the pile. Alas I never got around to planting the organic garden. So what I had was a mess: a great big pile of garbage in the back yard. But in my garbage, life bloomed. I got a bumper crop of tomatoes and melons straight off the pile. That’s how grace works. We make a mess. God creates new life right in the middle of it. Some parents bring their kids to be with Jesus. The grown-ups want to keep them away. Jesus says to let them come — and he blesses them. I’m guessing he played games and wrestled with them and generally had a ball, even if the text doesn’t go quite that far. Is he saying to accept the kingdom by accepting a child? Is he saying to accept the kingdom as if you were a child? Perhaps the ambiguity isn’t there in the Greek. I’m not going to go looking today. I’m going to dwell with the possibility that it is the second option. If I was to accept the kingdom as if I were a child, I could get totally over the hard words of the divorce passage. A child doesn’t spend too much time on the hard questions. A child doesn’t spend too much time avoiding grace because of feeling guilt and remorse. A child accepts love because love is offered — and revels in it. And that’s good news to Christians who struggle with their marriages, even when they end in divorce. This is very helpful perspective! Also I read the Four Horsemen article and going to share it on facebook. Thank you for both your work and sharing the link. You should check out Gottman’s books — Why Marriages Succeed or Fail is outstanding. And look online for his interview on NPR’s Fresh Air (at least that’s where I think I heard him). Amazing, and really solid research!